Start off your visit on the 21st (Sun): look and learn at Jantar Mantar - Jaipur, then step into the grandiose world of Amber Palace, and then step into the grandiose world of Jal Mahal. On the next day, take an in-depth tour of City Palace of Jaipur, admire the landmark architecture of Hawa Mahal - Palace of Wind, then identify plant and animal life at Elefriend, and finally head outdoors with Outdoor Activities. To see traveler tips, more things to do, and other tourist information, read Jaipur online sightseeing planner . Pune to Jaipur is an approximately 2.5-hour flight. You can also drive; or take a train. In April, daytime highs in Jaipur are 44°C, while nighttime lows are 27°C. Wrap up your sightseeing on the 22nd (Mon) to allow time to travel to New Delhi. Designed by notable English architects and proclaimed India's capital in 1931, New Delhi sits in the middle of a sprawling metropolitan area with a population of over 25 million. 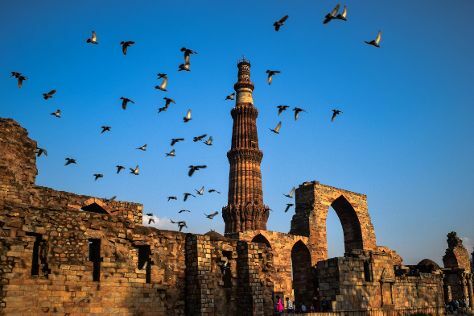 Kick off your visit on the 23rd (Tue): take in panoramic vistas at Qutub Minar, then don't miss a visit to Humayun's Tomb, and then steep yourself in history at India Gate. For photos, traveler tips, where to stay, and tourist information, go to the New Delhi holiday builder site . You can fly from Jaipur to New Delhi in 2.5 hours. Other options are to drive; or take a bus. Expect a daytime high around 43°C in April, and nighttime lows around 25°C. Wrap up your sightseeing on the 23rd (Tue) early enough to travel to Pothamedu. Kick off your visit on the 24th (Wed): admire the engineering at Mattupetty Dam, examine the collection at Tea Museum, and then take in the awesome beauty at Ottakathala Medu Mountain Range. Here are some ideas for day two: take in nature's colorful creations at Tea Gardens. To see more things to do, photos, where to stay, and tourist information, go to the Pothamedu online trip itinerary planner . Use the Route module to find suitable travel options from New Delhi to Pothamedu. Plan for somewhat warmer nights when traveling from New Delhi in April since evenings lows in Pothamedu dip to 29°C. Wrap up your sightseeing by early afternoon on the 25th (Thu) to allow enough time to travel back home.